Seren Bundy-Davies says it is "disappointing" she will be the only Welsh track and field athlete at the Rio Olympics next month. The 21-year-old will compete in the 400m individual race as well as the relay after being named in Team GB's 80-strong athletics team for the Games. Hurdler Rhys Williams has appealed against his omission from the squad. "There are a lot of people that are close to the standards and a few people that have run the standards," she said. "It is always hard to know who's going to get selected and it is disappointing there's not a bigger Welsh contingency. "It is what it is and I'm still going to try and run to the best of my ability and hopefully bring home a medal for Wales." Bundy-Davies, who helped Britain win 4x400m European relay gold, is the 21st Welsh competitor to be named for Rio 2016, which begins on 5 August. But Wales will have just one athletics competitor at an Olympics for the first time since the 1952 Helsinki Games, though that could change if Williams' appeal is successful. "I think there are two sides to it," explained Bundy-Davies, adding: "A lot of people have been quite unlucky. "Dai Greene [the 2011 world 400m hurdles champion] - he's struggled with injury and everyone knows he's capable of massive things if he's fit. "It is kind of unfortunate, but at the same time I think Welsh athletics is kind of up and coming. "There are a lot of younger people coming through that I'm sure will feature in the Commonwealth Games in a few years and the Olympics in 2020. "Sometimes it's just having patience, waiting for people to come through, but there's a lot of talent in Welsh sport at the moment, especially in athletics." 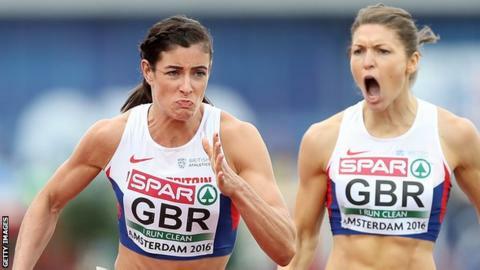 The 4x400m title in Amsterdam on Sunday was Team GB's first European gold in the event since 1969 and their run of three minutes 25.05 seconds was the fastest time in the world this year. Bundy-Davies also won relay bronze at last year's World Championships, having claimed individual bronze at the 2015 European Indoor Championships. Legendary former 110m hurdler Colin Jackson has already tipped her as a medal contender in Brazil and she feels winning a relay medal is "really realistic". "Bringing home the bronze medal last year showed we can medal at a world level," Bundy-Davies said. "I think we've got an even stronger relay squad this year. I think people are quicker and we want it just as much. "We've set a world lead in the European Championships and now we've won the gold medal we've showed we can do it at European level. "Now we need to compete on a world level against Jamaica and the USA." Bundy-Davies feels her best is yet to come in the individual 400m: "There's a lot of experience I still need to gain. "I think I will be peaking more four to eight years down the line. "Hopefully it will be realistic for me to bring home a medal from the 2018 Commonwealth Games and 2020 Olympics."